King Philip V (r. 1700-1746) appears here as a warrior riding into battle. Sometime after its initial creation, the painting was redone, transforming the King of Spain into Santiago Matamoros, St. James the Moor-slayer, a saint the Spanish called upon in their conquests of Islamic “infidels” in Spain and indigenous peoples in the New World. The battle scene behind Philip V is a dramatic one, with charging horses and canons firing. 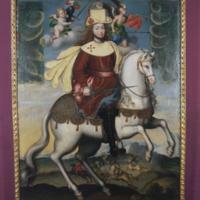 The king appears dressed here as Santiago Matamoros (St. James, the Moor Killer), signaled by his cream-colored cape marked with the saint’s cross and his pilgrim’s hat. These dark clouds were added over the original painting’s display of Spanish coats of arms, the edges of which can still be seen. The background depicts a generic landscape, not the Andes, where this portrait was created. Little is known about the patron of this work or the painters who created it. The figure of Philip V and his horse, the landscape and angels indicate a painter well-aware of European conventions of representation. However the stiffness of the king and his horse, as well as the gray-blue clouds in the corners implies practiced, but perhaps not wholly fluid, craftsmanship. The portrait was, like most in Spanish America, painted in oil paint on canvas. The color scheme, with its pale blues and pinkish tones are characteristic of Rococo painting in late 18th-century Spanish America. 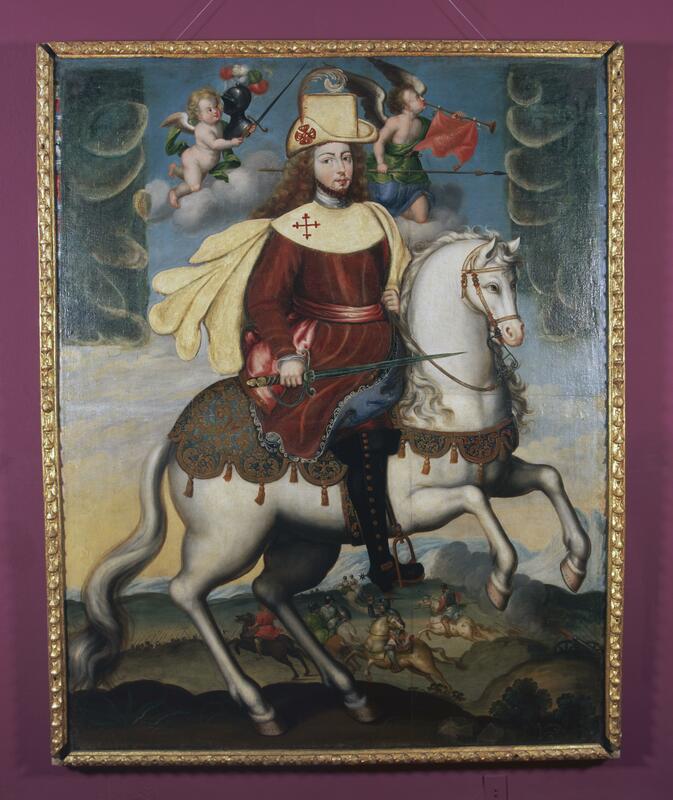 Yet the painting’s multiple layers—which shifted a standard royal portrait into an image of Santiago Matamoros—reveals, quite literally, how objects might be assigned new meanings over time. While over-painting was hardly unheard of in Spanish America, such clear traces of the conversion of one image into another rarely survive. Little is known about the original context of this painting. Today it is housed in the National Museum of Art in La Paz, Bolivia. The king and his appointees were the most visible governing powers in Spanish America, with portraits and palaces to mark their presence. As the wars of independence loosened Peru’s ties to the Spanish monarchy, royal portraits lost their currency. This may be one reason this painting was converted into a religious image of Saint James, a saint whose cultural and political significance—as vanquisher of infidels and protector of the Catholic faith—remained potent. Mesa, José de and Teresa Gisbert. 1991. La pintura en los museos de Bolivia. La Paz: Editorial “Los Amigos del Libro,” Werner Guttentag. Villegas de Aneiva, Teresa, et al. n.d. La Paz y sus museos de arte. La Paz: Electropaz.